Use pepsin to cleve the peptide bonds in hemoglobin and observe its catalytic activity with and without pepstatin. The data collected will be used in a future experiment. The procedure for the lab can be found in Dr. Hartings lab notebook. Instead of 1.7 M perchloric acid, it was 1 M of perchloric acid. For the concnetration of pepstatin added, the group decided upon 0.2 μM. 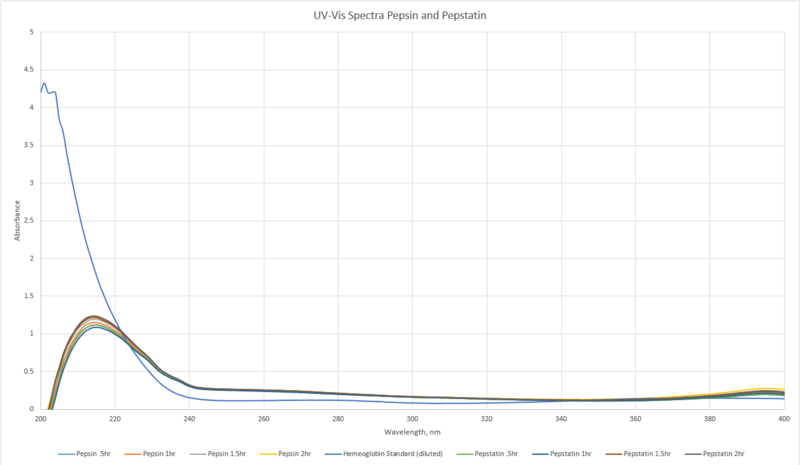 For a reference in the UV-Vis, hemoglobin stock solution was diluted from 10μL to 1mL.